Search Results for "stirring chocolate"
Stirring hot chocolate. The melted chocolate is prepared to make sweets. UNITED STATES 1970s: Close up of melted chocolate, zoom out to hand stirring chocolate / View of fruits and nuts / Close up, forks drop fruit in chocolate sauce / Dissolve, kids eat ice cream / Girl eats ice cream. Hand stirring chocolate cream in mixing bowl. Closeup stirring chocolate chips into raw cookie dough in 4k. Macro shot of a black spatula combining the bittersweet chips into a tasty, sweet batter. Top view can be used for step by step gif recipes, salmonella outbreaks and unhealthy diets. Stirring chocolate cream with a hand mixer. Female hands stirring chocolate dough with a mixer for cake. Stirring liquid chocolate with pre-made bars of chocolate, tempering it, which encourages chocolate crystals to form in the desired structure for a good snap and glossy finish when it hardens. Overcranked at 60fps for slow motion. 4K view of stirring warm chocolate. Melted chocolate in a bowl for making sweets. 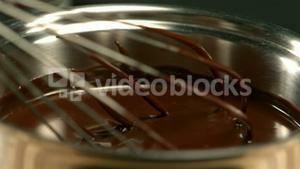 4K view of stirring warm chocolate by a professional confectioner. Melted chocolate is prepared for making sweets. Top view of a female hand with a spatula stirring the chocolate dough in a glass bowl. Stirring melted chocolate with a spoon.